Supply chain experts are skeptical the $67 billion Cigna Corp.-Express Scripts deal will do much to transform the healthcare industry, let alone deliver any significant savings to customers. Health insurer Cigna said early Thursday that it is buying the nation's No. 1 pharmacy benefit manager Express Scripts for $52 billion in cash and will assume $15 billion in Express Scripts' debt. The companies' top executives said the combination would make healthcare simpler and more personalized, while also driving higher quality and affordability for consumers by offering a broad spectrum of products under one roof. But what the merger really does is allow Cigna to lower its costs by insourcing PBM services, and absorb the profits of the biggest stand-alone PBM at a time when its competitors are also pairing up with providers of pharmacy services. Aetna, for instance, will soon be a unit within CVS Health, which gets most of its revenue from its PBM services. The combined Cigna-Express Scripts company would have $141.7 billion in revenue. This type of merger is also more likely to gain regulatory approval than if Cigna were to try once again to merge with another insurer. Cigna's previous attempt to merge with rival Anthem was blocked by the federal government because it threatened to harm competition. The merger is not going to drive savings for Cigna and Express Scripts' customers, including other health plans, employers and patients, several experts insisted. "It's just not going to happen," said Tom Borzilleri, former CEO of PBM ValoreRx who is now the CEO of Intelisys Health, a technology company that provides drug price transparency. "This is more a move to drive further profitability, but there isn't any anticipated trickle-down effect for customers." This story has played out before when UnitedHealth's Optum unit bought PBM Catamaran, promising efficiencies and savings for the customers, but those benefits never materialized, he said. Copays and deductibles have continued to climb. The notoriously secretive PBM industry is also unlikely to become more transparent, some said. PBMs are the middlemen that build formularies and negotiate drug rebates from pharmaceutical manufacturers. While they pass some of those rebates on to health plans and contracted employers, they also pocket a portion. Confidential contracts make it difficult to know just how much they keep. "With all of these insurer-PBM mergers, none of them have shown to benefit the consumer," said Pramod John, CEO and founder of Vivio Health, a specialty pharmacy management firm. He added that Optum has some of the highest pricing and is resistant to sharing data. "Now there is less transparency because the lines between payer and provider are being blurred." Investors are skeptical of the deal as well. Cigna's stock price dropped 11.4% by Thursday's close. 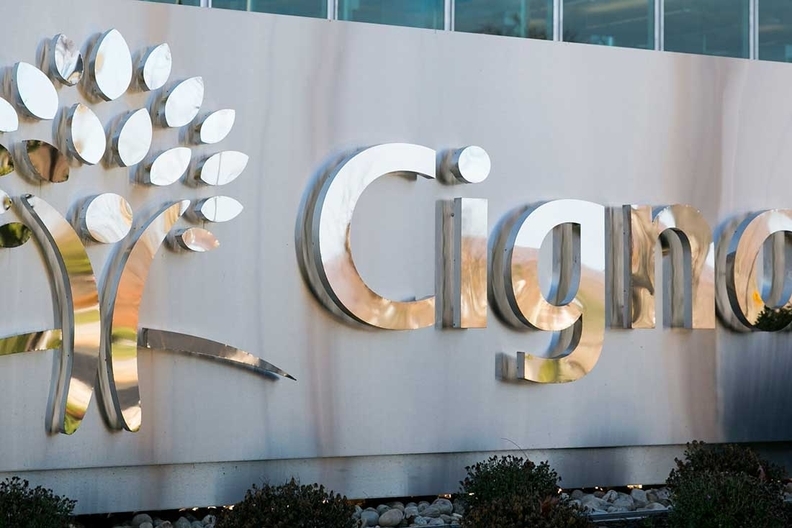 Many Cigna investors were expecting the insurer to use its capital to buy another health plan with a strong presence in Medicare Advantage or Medicaid. But Express Scripts' shares went up 8.6% in the wake of the news. Gurpreet Singh, health services sector leader at consultancy PricewaterhouseCoopers, offered a different take. In addition to using its scale to negotiate better deals with specialty drug manufacturers, the combined Cigna-Express Scripts could use medical and pharmacy data to improve medication adherence, he said. "This removes some of the inefficiency between drug pricing and those negotiated deals," Singh said. "It could illuminate the black box of PBMs and allow for better transparency and better cost efficiency." The combination of Cigna and Express Scripts is the latest in a string of mergers between nontraditional healthcare partners looking to disrupt the industry. Retail chain and pharmacy benefit manager CVS Health is buying health insurer Aetna in another blockbuster deal worth $69 billion, for instance. Other proposed combinations include UnitedHealth Group's Optum and DaVita's medical group, and Humana and Kindred Healthcare—partnerships designed to steer patients away from hospitals and toward lower cost providers. Cigna and Express Scripts are both embroiled in separate litigation involving Anthem. Cigna sued Anthem in February 2017 for a $1.85 billion breakup fee plus $13 billion in damages resulting from the failed merger attempt, and Anthem countersued. The companies are slated to go to trial in 2019. Meanwhile, Express Scripts is dealing with a lawsuit brought by its biggest client Anthem in early 2016 alleging the pharmacy benefit manager didn't pass along billions in savings from negotiated drug prices. Anthem since then said it would not renew its PBM contract with Express Scripts. The loss of Anthem threatened Express Scripts ability to continue as one of the last stand-alone PBMs. Cigna CEO David Cordani, who will become the president and CEO of the combined company, and Express Scripts President and CEO Tim Wentworth, who will become president of the PBM unit within Cigna, characterized the proposed marriage as one focused on providing choice and personalized healthcare products for customers. The combined company would cover the entire spectrum of care, providing a suite of medical, behavioral, specialty pharmacy and other health engagement services, they said. "This combination accelerates Cigna's enterprise mission of improving the health, well-being and sense of security of those we serve, and in turn, expanding the breadth of services for our customers, partners, clients, health plans and communities," Cordani said in a statement. "Together, we will create an expanded portfolio of health services, delivering greater consumer choice, closer alignment between the customer and health care provider, and more personalized value." The companies expect the deal to close by year-end. The combined company would be based at Cigna's headquarters in Bloomfield, Conn., while Express Scripts would remain at its St. Louis headquarters. Four members of the Express Scripts board will join the combined company's board of directors. The deal will have to gain approval from Cigna and Express Scripts' shareholders, as well as state and federal regulators. After closing, Cigna shareholders would own about 64% of the combined company and Express Scripts shareholders would own approximately 36%. Wentworth said Express Scripts' existing relationships with health plans would not change, and the company would maintain guardrails to protect health plans' data. Cigna served 15.9 million customers in 2017 while reporting revenue of $41.6 billion and profit of $2.2 billion. Express Scripts' 2017 revenue totaled $100.1 billion, while its profit was $4.5 billion. Alex Kacik contributed to this story.